North and South Korea have requested to have unified Korean teams in basketball, hockey, judo and rowing to compete in the qualification for the Tokyo 2020 Olympic Games, the International Olympic Committee (IOC) has said. 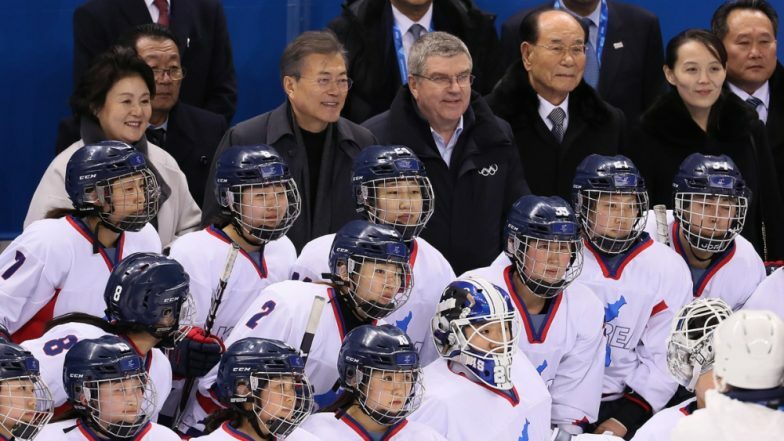 The IOC announcement on the organisation's official website on Friday stated that the Korean request for unified teams included the competitions of women's basketball, women's hockey, a judo mixed-team event and many of the women's and men's rowing events, reports Efe news. Tokyo Olympics 2020: India Women's Football Team to Play Against Hong Kong & Indonesia Ahead of Round 2 Qualifiers. "One year after the successful Olympic Winter Games Pyeongchang 2018, the International Olympic Committee today organised a working meeting to discuss further sports cooperation between the Republic of Korea (KOR) and the Democratic People's Republic Of Korea (PRK)," the IOC's website read. "The parties agreed on the principles guiding such unified Korean teams by sport and discipline," the IOC's statement added. "It was decided that participation in the Olympic Games Tokyo 2020 would be based on successful qualification in those sports and disciplines for which both National Olympic Committees wish to compete as a unified Korean team." The IOC confirmed that the request had yet to be fully studied with the respective international federations of the mentioned sports. It added that the World Anti-Doping Agency will subject all Korean athletes to the same anti-doping controls. According to the committee, both Koreas will also discuss the inclusion of further sports which should be presented before the due date of the Tokyo 2020 qualifications. "Any result will need the approval of the IOC Executive Board, which has its next meeting from March 26 to March 28, 2019 in Lausanne," the statement said.